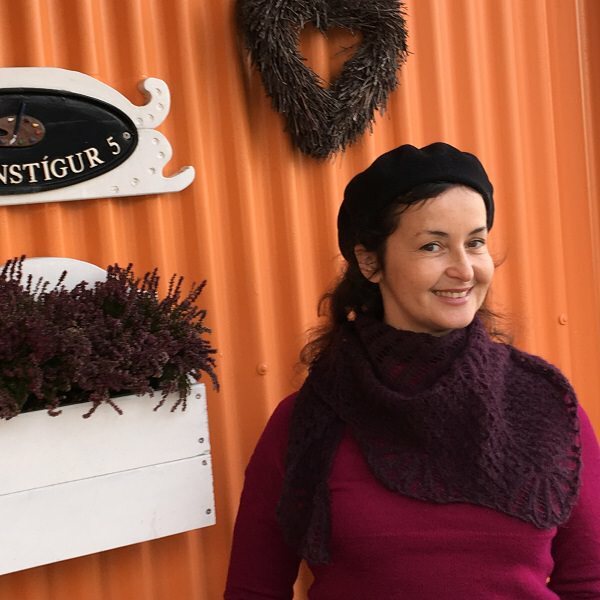 Randalín is a lovely striped shawl with a rose trellis pattern on a garter stitch background and is originally part of the Icelandic book Þríhyrnur og langsjöl. 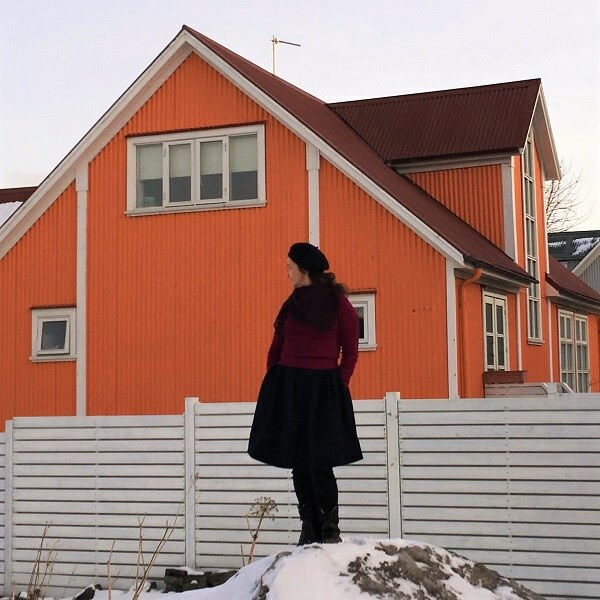 With the permission of the author, Randalín is now available as an exclusive Love Story KIT from the Icelandic Knitter. I used the opportunity to revise the pattern with new clearer charts and written instructions. Worked from the bottom up and with only a 2 row repeat to follow and relatively big needles, it is a fairly easy and quick knit. 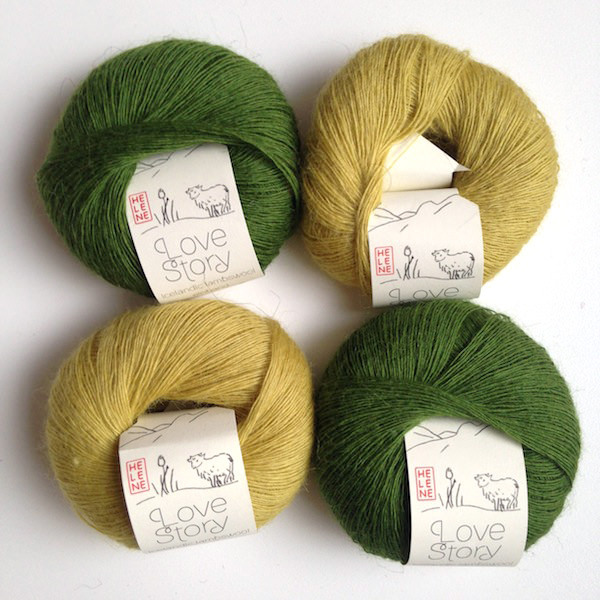 It looks absolutely amazing knitted with the very fine Love Story. 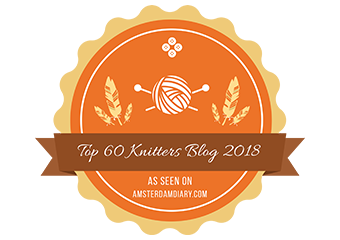 The shawls shown are knitted with Love Story in Natural Brown and Hot Spring Blue for a soothing natural look or the Thyme Purple and Salmon Orange for a stylish city look, vibrating with life. 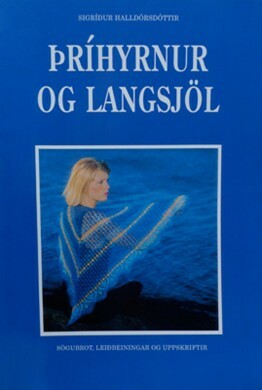 Randalín is part of the book Þríhyrnur og langsjöl (Three Cornered and Long Shawls) by Sígríður Halldórsdóttir, published in 1988, is a reference for traditional Icelandic lace shawls. The book is available here together with an English translation leaflet. 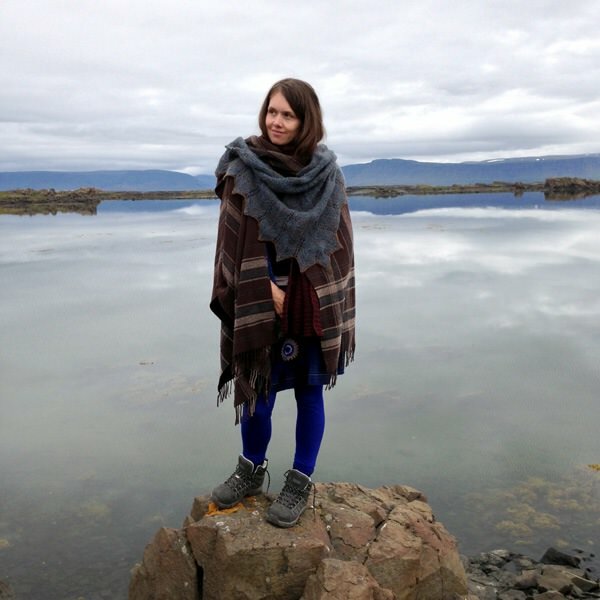 It is a compilation of 27 triangular and long lace shawls patterns with detailed explanations and techniques, as well as a little history of Icelandic lace shawls. 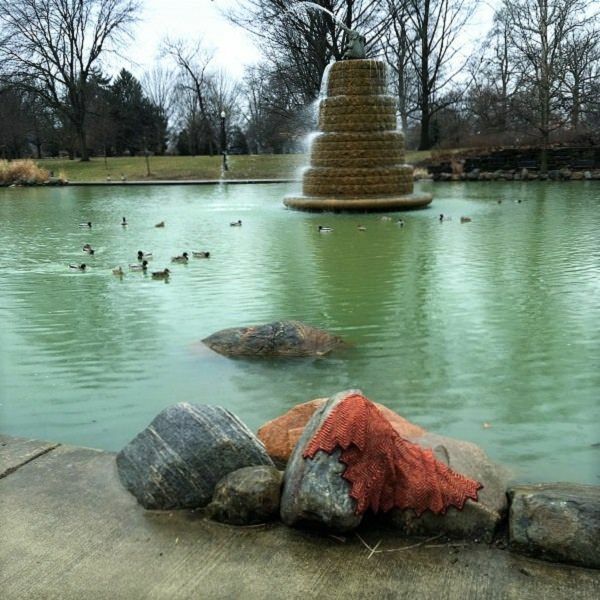 Patterns reproduce Old shawls from the 19th and 20th century and tell about what is known of their origins. 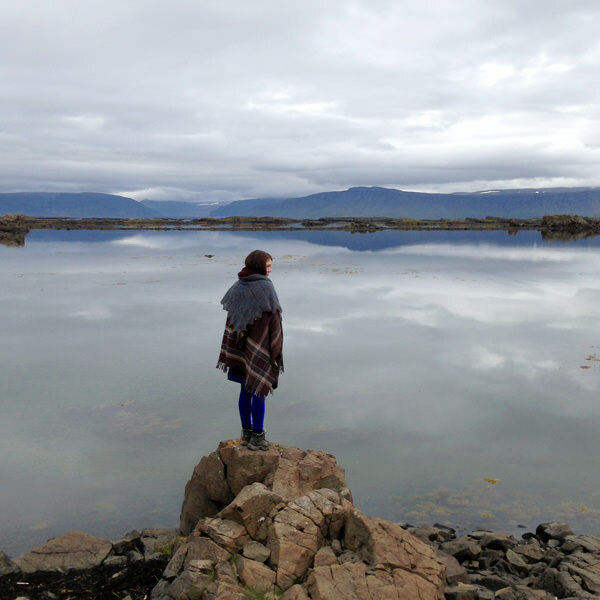 A few patterns were designed by Sigríður herself but inspired by the Old ones. In the past, various knitting designs similar to the Randalín shawl were quite common on all kinds of clothing. Sometimes this knit trellis pattern was used instead of ribbing on mittens but most often it was used on the so called “sheaths” or sleeves that were knitted cylinders used to shield the wrists and forearms. The pattern was also used on knitted undergarment petticoats, with a bodice, which were common attire on young girls. 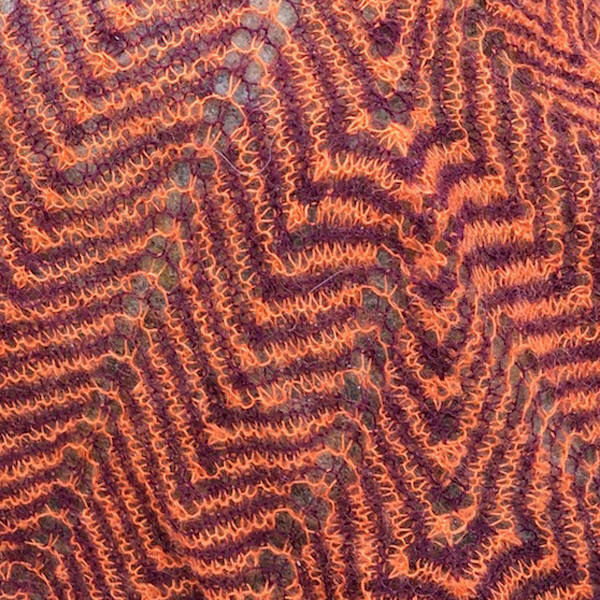 Many variations of this pattern exist, and what they have in common is that the stitch pattern is diagonal, alternately leaning to the left and right creating arrow like patterns. 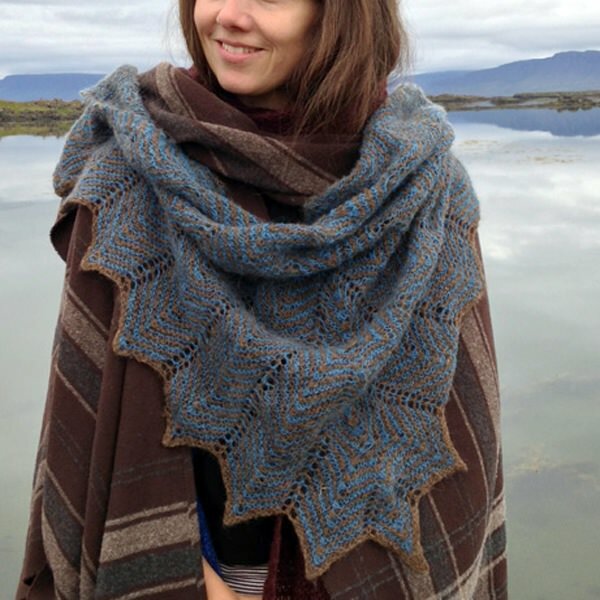 Randalin’s rose trellis pattern is somewhat unique in traditional Icelandic because it’s on a garter stitch background . 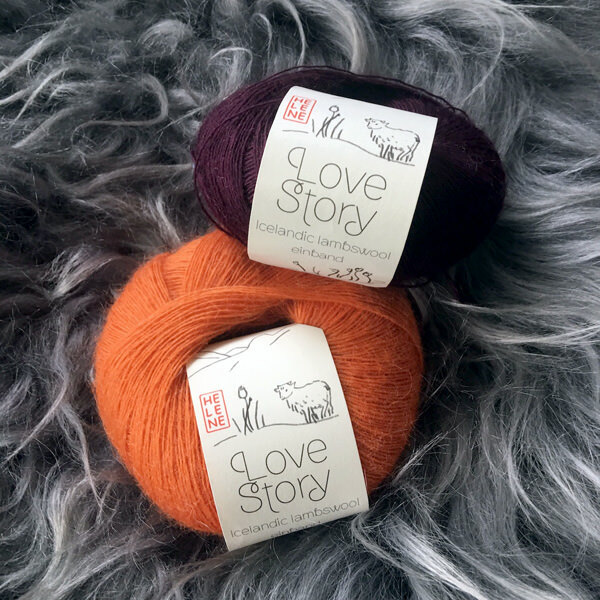 The kits (PDF pattern + 4 skeins of Love Story) are available in the online shop in Natural brown/ Hot spring blue and Thyme purple/ Salmon orange but you can also purchase it in any color combination of your choice among the 18 beautiful Love Story colors. Simply indicate which colors you would like when you make your purchase. Here are some ideas that would look stunning! 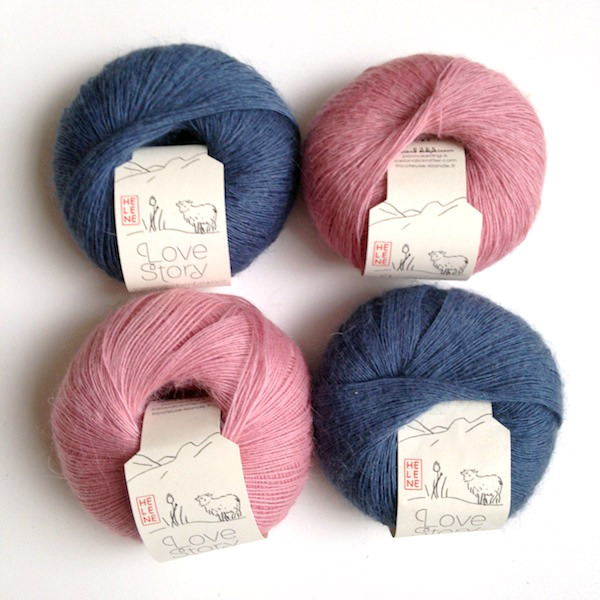 Love Story in Silene pink and Hot spring blue, for a Pantone colors of the year look! 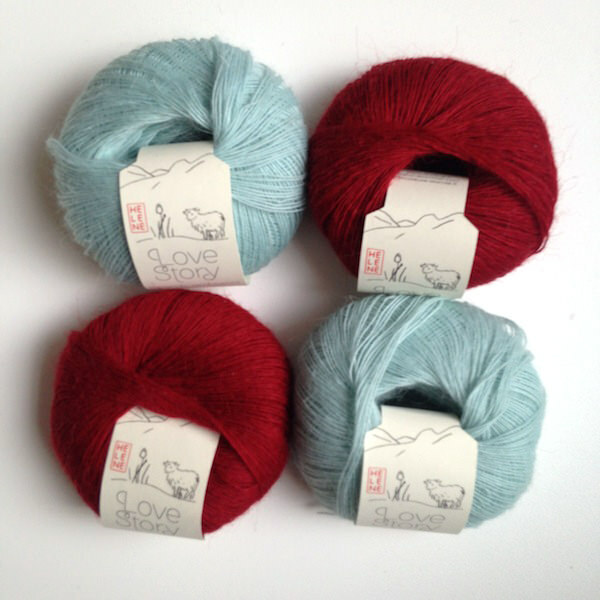 Love Story in Askja blue and Volcanic red, a favorite of mine (works well too with Glacier turquoise). 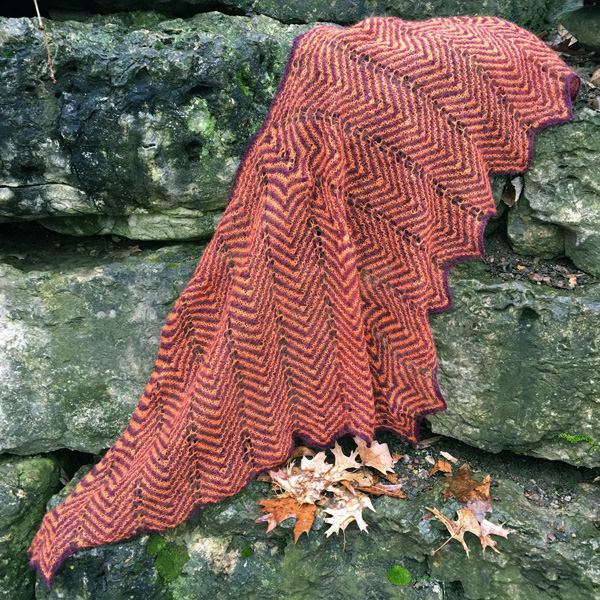 The shawl uses just 4 skeins of yarn, two of each color, but you could go wild with a multicolor stripped version! 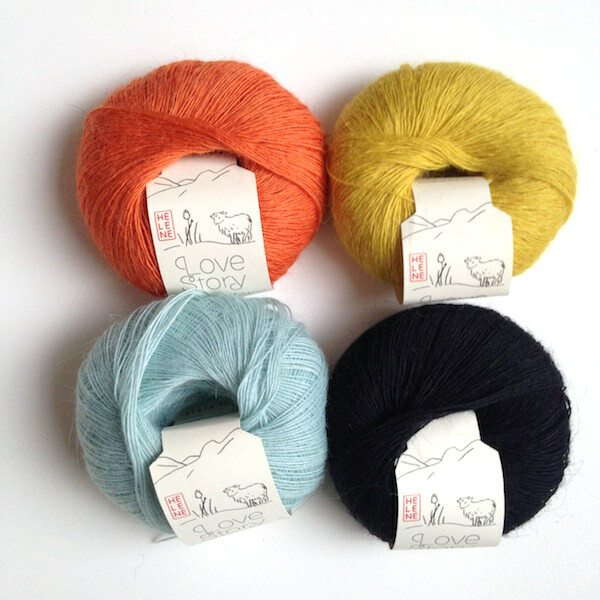 For example Salmon orange, Sulfure yellow, Askja blue and Raven black – like a puffin beak! 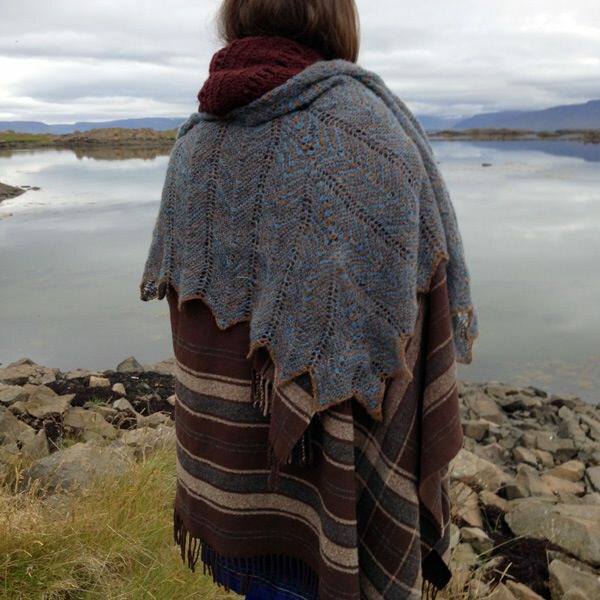 The original shawl in the book was in brown and blue. 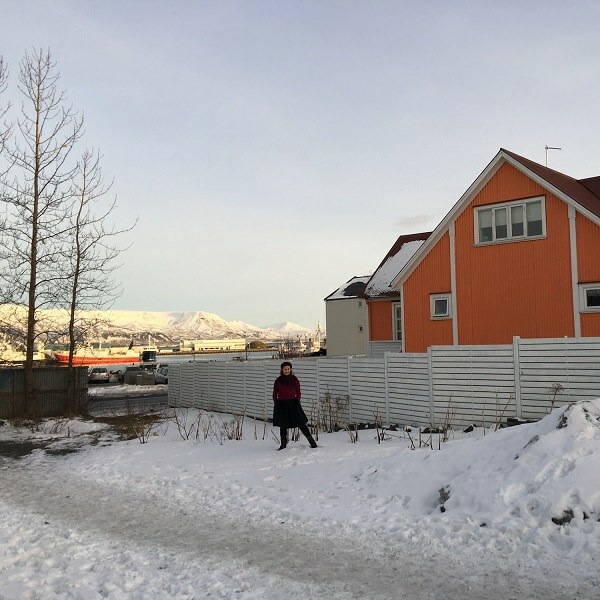 A sunny winter day’s walk through Reykjavík provided the inspiration for the bold Thyme Purple and Salmon Orange combination. 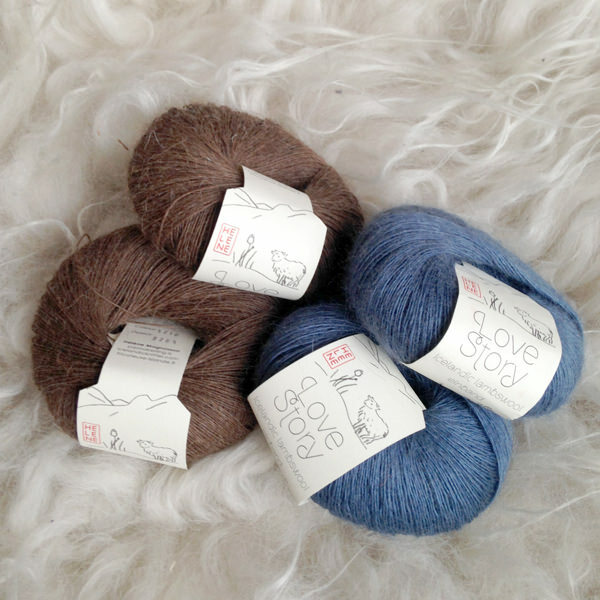 Pattern and yarn are available here! 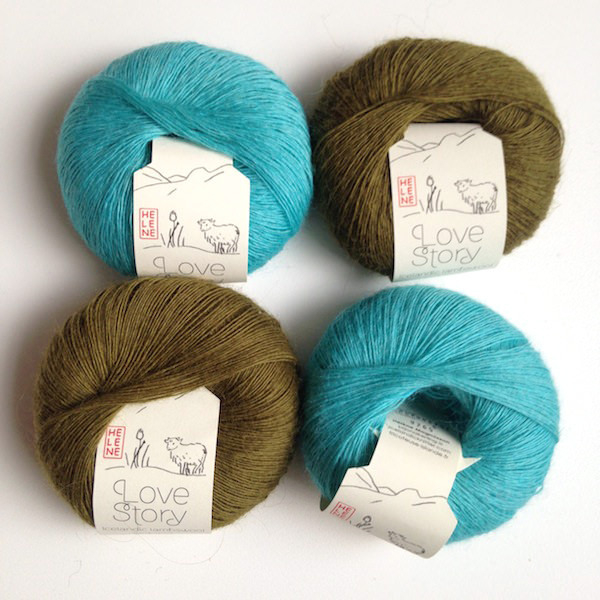 I’m truly looking forward to seeing all your beautiful Randalín shawls! 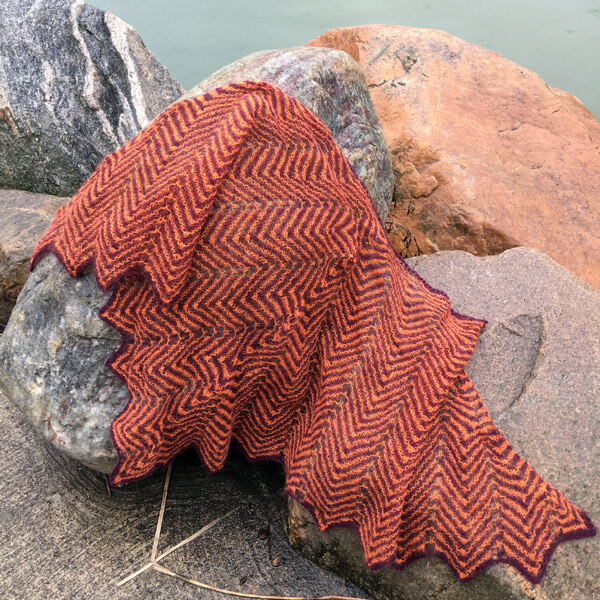 This entry was posted in New pattern and tagged accessories, lace, love story, needles 4 mm / US 6, Randalin, shawl, single ply lace.